August 28th 2002 saw the dawn of a new era in Europe with the successful launch of a new series of all digital Meteosat geostationary satellites, MSG-1 [Meteosat Second Generation]. The launch was planned for August 27th but the countdown was held 7 minutes before launch owing to a computer glitch. The 'launch window' was extended but the problem could not be solved in time and the launch was postponed until the next evening. 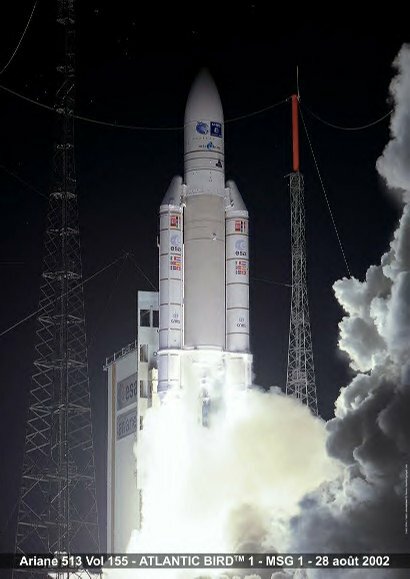 The following evening after a short hold in the countdown, MSG-1 and co-passenger Atlantic Bird-1 roared into the night sky above the European Spaceport in Kourou aboard an Ariane-5 launcher in a spectacular and perfect launch. MSG-1 was accurately placed into elliptical Geostationary Transfer Orbit - one end of which is close to the Earth and the other out at the geostationary satellite orbit altitude. At this point control of the satellite was handled by ESOC - the European Space Operations Centre of ESA in Darmstadt. A few days later, thrusters were fired at the far end of the elliptical orbit to steer the satellite into the geostationary plane. MSG-1 was then slowly drifted to 10 deg. W and control was handed over to EUMETSAT on September 25th. The first phase of commissioning began shortly after. Not only did the satellite have to undergo commissioning but a completely new ground segment system required verifying. Satellite commissioning would last about 10 months before MSG-1 would drifted to 0 deg. to become the operational satellite and then be renamed Meteosat-8.